In the Old Testament the day of the Lord was a time when God would intervene in the world to set right those things that had gone wrong. The Israelites thought that on that day God would save them despite their bad behavior. Unfortunately, tragic circumstances awaited Israel and Assyria conquered the northern kingdom of Israel in 722 BC, fulfilling this prophecy. In our own lives we can become self-assured like Israel was. Because we are God’s people, we think we should somehow be exempt from crisis and tragedy. But sometimes we just have a bad day… or a series of bad days! Amos explains what a bad day is in vs. 19. 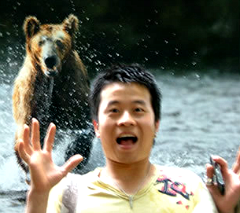 A man runs from a lion only to meet a bear and he escapes from the bear. But, while seeking refuge in his own home, he leans against a wall and is bitten by a snake. Now that’s how to have a bad day! And it can happen just when you think everything is going great! In fact, a bad day usually comes along when everything is going great. But, sometimes when things are going great, we have a tendency to forget God and get secure in our own selves. Then, when misfortune strikes we bemoan God for our difficulties. Don’t let bad days be obstacles in your spiritual development; rather let bad days be opportunities for spiritual renewal and revival! When you seek the Lord for restoration and deliverance from your troubles, He will become your joy and your hope! “Rejoice in our confident hope. Be patient in trouble, and keep on praying.” (Romans 12:2, NLT). This entry was posted in adversity, faithfulness and tagged adversity, Bible. Bookmark the permalink.